It seemed everyone was there. Leaders were trained and leaders trained. The numbers were impressive. Around 900 members were in attendance at the two events on June 1 and June 29. The variety of sessions offered more than officers’ training. The highlighted workshops included "Secrets to Better Photos", "Job Interview: Get Them to Say Yes", "7 Habits of Successful Leaders", "Winning a Humorous Speech Contest", "The P5 Model for Presentation Success", "You Can Turn the Table on Table Topics", "Sharing the Gift of Toastmasters: A Simple Way to Build a New Club", and "They're Not Laughing Because You're Not Funny. But You Can Be". Much magic was required from almost 50 volunteers at each event to plan the day and deliver the 25 educational classes each appropriately at Chapman and Biola Universities. Recognition and appreciation must be given to Siri Payakapan, DTM and Wilma Springer, DTM, PDG who planned and coordinated the event, spread the message and assured that the day would be memorable and club officers would be ready to lead Founder’s District to greatness and be Distinguished for the 2013-2014 terms. Several Toastmasters members with iPhones walked around taking pictures of the activity. The photos were uploaded in real-time using the Adobe Grouppix app. You can view the photos here. Marriages that last seem to receive less attention than high profile, short term break-ups. The media has it all wrong. Let's take a stand and shower attention on the simple and good things in life, after all good things last the longest. 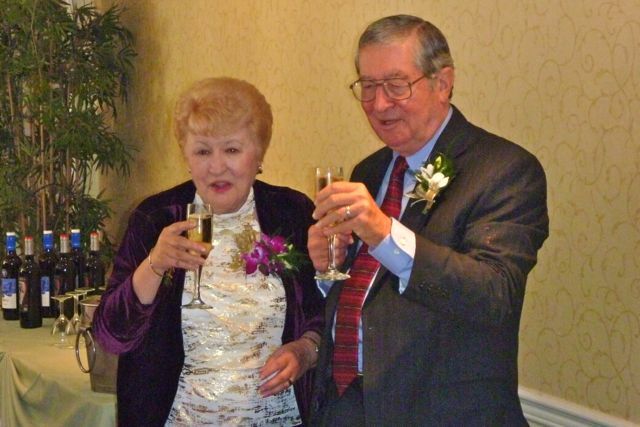 Fellow Toastmaster Luby and her husband Bob just celebrated their 50th wedding anniversary. What can you say about a couple of crazy kids that married on the steps of Avalon Community Church on November 10, 1962, on Catalina Island, Calif., and returned fifty years later to renew their vows on the same church steps? Good Afternoon, my name is Michael Varma and I met Luby more than ten years ago at a Toastmasters meeting. Luby is our resident celebrity. She a triple threat: she acts, she sings and can tap dance her way out of a question she doesn’t want to answer. And we’re here to celebrate her 50th wedding anniversary to Bob. Fifty years is quite an achievement. Most folks don’t make it that far. Britney Spear’s first marriage to childhood friend Jason Alexander lasted 55 hours. Kim Kardashian's second marriage to New Jersey Nets forward Kris Humphries lasted a mere 72 days. But those are marriages that didn’t make it. How about other celebrities that are still together? Hollywood sweethearts Tom Hanks and Rita Wilson are still together, but it’s only been 24 years. Luby and Bob, you’re at 50 years. That’s five times more love than I’ve yet known. I’m in awe and offer this anniversary toast. Michael Varma (right) accepts the Diamond Web award from John Barry, Community Relations and Recognition Chairperson, for designing a new website for the BergenMeisters Toastmasters Club using free Google Site software. 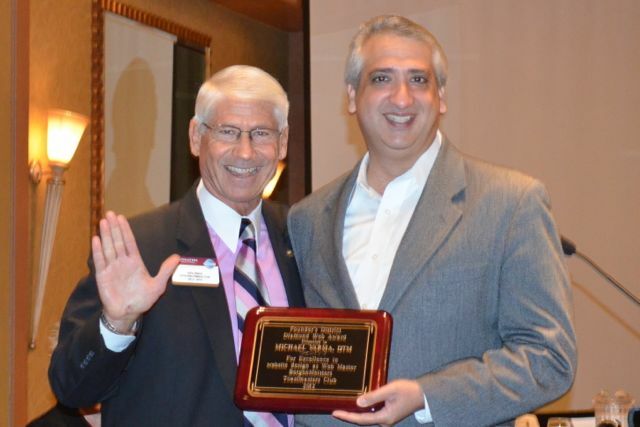 Contributed photo.By creating a new website using free Google Site software, Michael Varma was awarded the Diamond Web Award at the Toastmasters Founder’s District Fall Conference on Saturday, Nov. 4, 2012, at the Sheraton Hotel in Cerritos, California. Varma, a Distinguished Toastmaster and webmaster for the BergenMeisters Toastmasters club, created a new informational and interactive website for the public speaking organization that gives site visitors the ability to communicate more effectively at work and at play . Entries were judged by independent web designers on content (65%) and presentation (35%) with an emphasis on portraying the benefits of the Toastmasters program to meet personal and professional goals. BergenMeisters Toastmasters club meet on the 2nd and 4th Thursday of each month from 12 to 1 p.m. at 505 City Parkway West, Orange, CA 92868. For more information about the club, please visit BergenMeisters.org. Toastmasters International is a nonprofit educational organization that teaches public speaking and leadership skills through a worldwide network of clubs. The organization currently has more than 260,000 members in approximately 12,500 clubs in 113 countries. Since its founding in October 1924, the organization has helped more than 4 million men and women give presentations with poise and confidence. 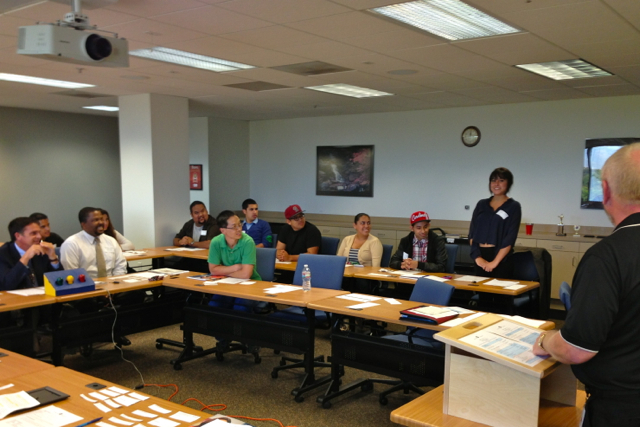 For information about local Toastmasters clubs, please visit toastmasters.org . Funny-man and sometimes serious-guy Michael Varma, DTM, was honored by Toastmasters at the recent Founder’s District Executive Council ceremony: “Best Male Actor in a Comedy” for his appearance in a video promoting the communication organization’s Humorous Speech Contest, and the more serious 2013 Toastmasters Distinguished Service Award, for his contributions to the international non-profit that helps people hone their communication and leadership skills. Toastmasters everywhere are learning to set lofty goals, meet them, and enjoy the spoils of success. And we find that there are those around us who are more than willing to help us succeed in our endeavors. In Toastmasters we honor them with plaques, certificates, and awards for going above and beyond the call of duty. But the ones who support us the most, and who deserve the highest appreciation, are the ones who stand by our side, each and every day. Our spouses, our partners, and our loved ones, whether they are members of Toastmasters or not, are the ones who silently guide us, inspire us, and complete us. They struggle when we struggle, suffer when we suffer, and celebrate when we succeed. We are empowered by the unconditional love they bestow on us. 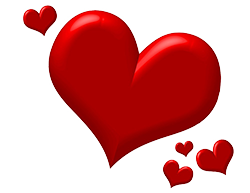 This Valentine's day, Founder's District invites you to take a break from Toastmasters and honor the one who loves you the most, with all of the pomp and flair they deserve. Put your best Toastmaster's leadership and communication skills to work for you and do something extraordinarily special for your loved one. Post your most creative and unforgettable moment together this Valentine's Day on the Founder's District Facebook page and enter to win a $25 gift certificate and your story featured in the next Founder Newsletter. Include a story and photo or video. Three winners will be picked. 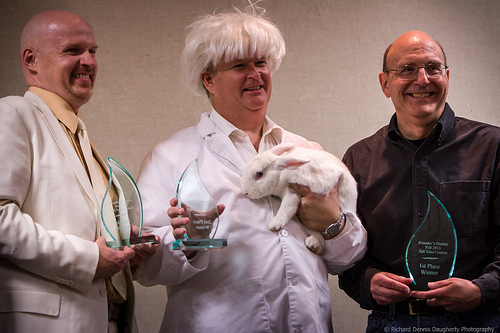 We'll choose the ones that best exemplifies the Toastmaster's love. 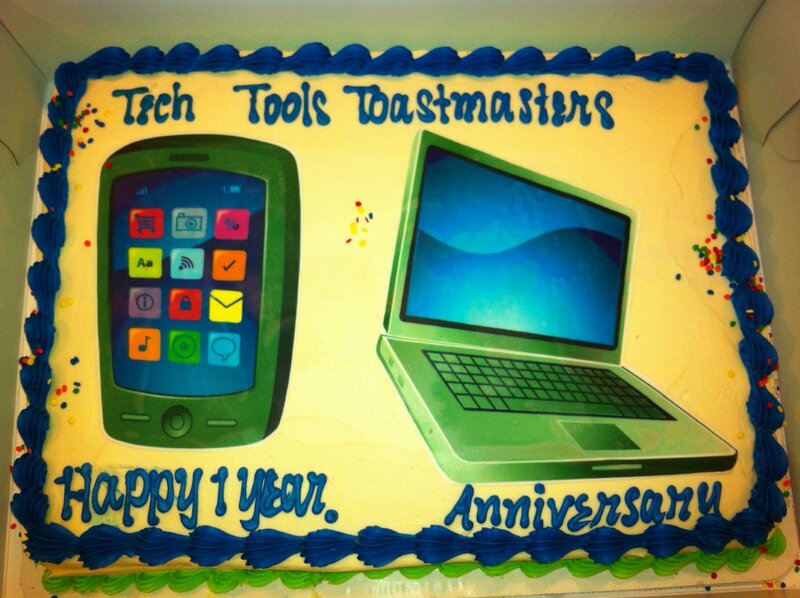 Founder's District Tech Tools Toastmasters Club #2094157 celebrated its first anniversary with an open house that enthralled all in attendance. The event took place on Saturday, November 10, 2012 from 6:30 to 8:30 p.m. at the Tyrol Plaza Club House at 891 S. State College Blvd., Anaheim,CA 92806. Do you hear the drums? It’s “The Rhythm of Teamwork!” Come to the Founder’s District Fall Conference on Saturday, November 9, to discover how something as simple as drumming can enhance your communication and leadership skills and help your clubs develop strong, cohesive teams. The Fall Conference will be at the La Mirada Holiday Inn and Conference Center. Registration opens at 7:00 a.m. with a continental breakfast. The program starts promptly at 8:30 a.m., but be there early—we have some surprises for you. Check out the Conference Information page for more information about our keynote presentation, our C&L Recipient (a non-Toastmasters related person or organization that provides leadership and communication in our communities), the education sessions, the business meeting, the Hall of Fame luncheon, and, oh, yes, the Evaluation and Tall Tales Contests. Did I mention there will be opportunity drawing gifts, a silent auction, the bookstore, and the Drum Café booth? If you register before the early-bird date of November 2, you only pay $65 PLUS you get a free opportunity drawing ticket. Come be part of the fun and excitement! 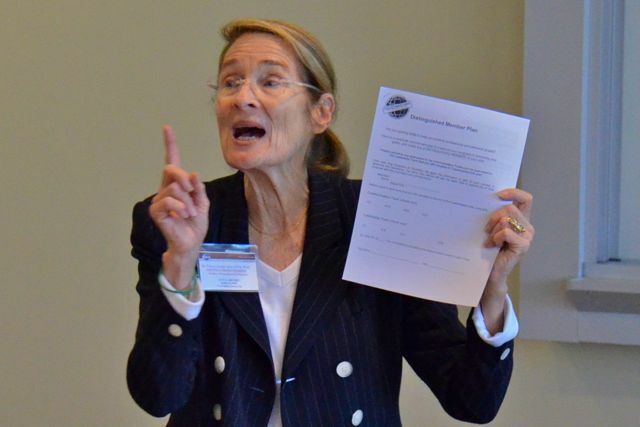 International award-winning trainer and Distinguished Toastmaster Sheryl Roush, crowned the "Queen of Content" by the Founder's District, shares how to get paid for your presentations when you learn how to Speak And Market Like a Pro! All levels of speakers will discover valuable skills that can be used immediately. This fast-paced two-hour program provides more than 36 tips and 3 solid gold templates to help you design your marketing materials with greater know-how, confidence, and professionalism. Sheryl's insider's point-of-view as a marketing and graphic designer of 35 years and more than 25 successful years as a paid speaker can jump-start your speaking business. So when she gives away time saving secrets on what-goes-where and why on the speaker's one-sheet template, you know it's solid gold marketing. The Founder's District and Speakers Bureau are thrilled to have Sheryl Roush return to give, and give again, to help you succeed and achieve your presentation dreams. Best of all, this workshop of "Speak And Market Like a Pro!" 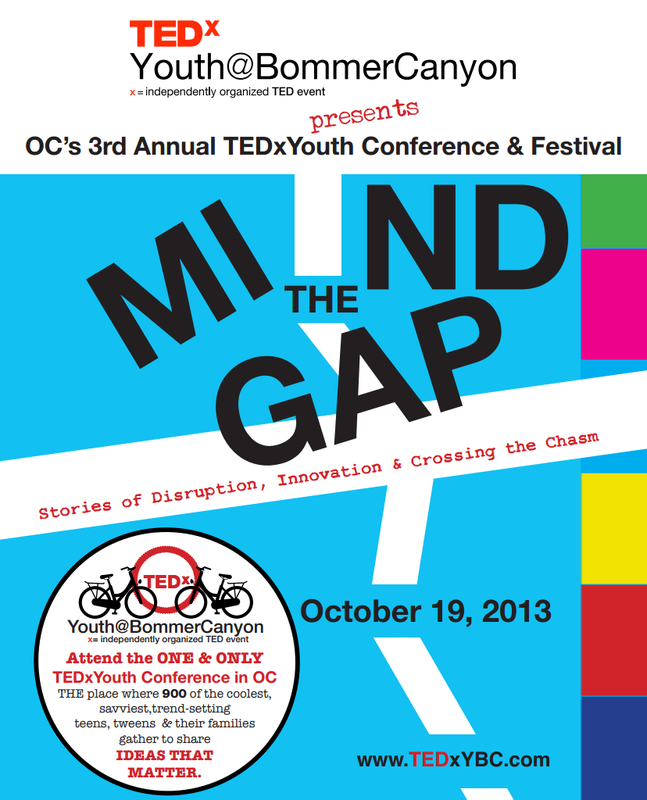 held at National University in Costa Mesa on March 12, 2014, is free. Register here and if full, click on "Add to Waitlist". Contestants at the November 9th conference “stretch the truth” to audience delight! Speech competitions at the district level are always a treat for spectators and when the affair includes Tall Tales, the entertainment factor skyrockets. 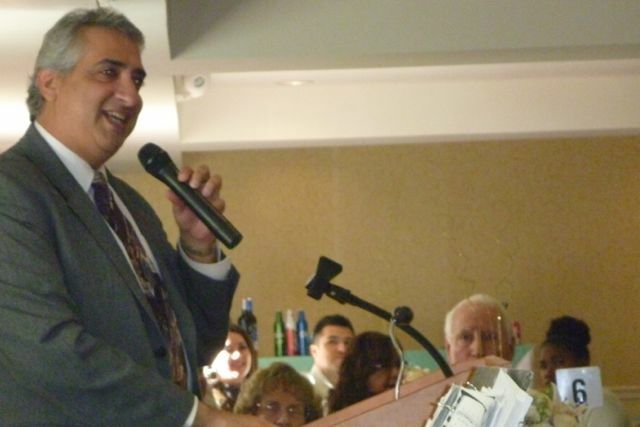 The big event, emceed by Contest-master Jeanne Cassidy, was held at the La Mirada Holiday Inn and was the grand finale to an action-packed conference that is sure to go down in the record books as one of the best ever! What recent Founder's District Event combined eating birthday cake, extoling the virtues of procrastination, frolicking with a 160 pound wolf, staring at the Mona Lisa, and mingling with 214 Toastmasters members and guests (not necessarily in that order)? If you guessed our Spring Conference, then you would be absolutely correct! 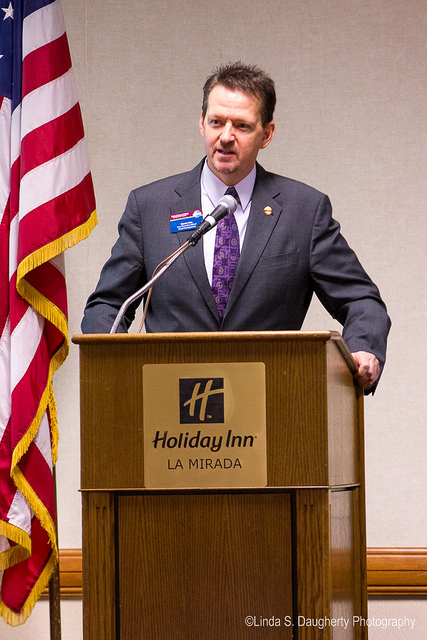 On May 3, 2014, Toastmasters from all over Southern California gathered at the Beautiful La Mirada Holiday Inn to celebrate our district's 70th birthday and Toastmaster International's 90th birthday! Daniel Rex, CEO of TMI, kicked off the extravaganza with a riveting keynote address that showcased all the amazing milestones that have been reached throughout the decades. He wished that Founder Ralph Smedly -- who could only wistfully dream of someday having four-hundred clubs…an impossible number in his lifetime -- could see how we currently charter that very amount…EVERY SIX MONTHS! Wow! Check out all of the conference photos here. Founder's District is excited to announce our Spring 2015 Marketing Workshop! Join us on Saturday, March 7 from 9:00 AM to 2:00 PM at the Santa Anita Church in Arcadia.